The design bureau and Russian Helicopters offer to help the Indian Navy meet its shortage of helicopters by supplying Ka-52Ks. Russia’s Kamov helicopter design bureau and Russian Helicopters are ready to jointly supply modern seaborne helicopters for the Indian Navy on request, Kamov Chief Designer Sergei Mikheyev said on Tuesday. 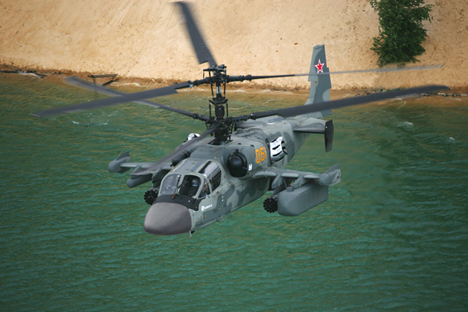 “Upon request from the Indian Navy, we are ready to supply jointly with Russian Helicopters the necessary number of seaborne helicopters and offer the latest developments to the Indian side, including the Ka-52K helicopters,” Mikheyev said. Helicopters operational in the Indian Navy and Coastal Guard have long grown obsolete over the absence of programs for the purchase of helicopters in the past decade, strict armament-buying procedures and the scandal-hit Augusta-Westland chopper deal, India Today reported recently. The deteriorating condition of helicopters prompted Indian Defence Minister Arun Jaitley to raise the issues at a session of the Defence Acquisition Council on July 19. Many Indian warships equipped with two hangars have no helicopters on their board, India Today said. In particular, only three out of six Talwar-class frigates are supplied with choppers while others have none. The Indian Navy and Coastal Guard have only 20 percent of the required number of helicopters, according to the magazine’s website. Sources tell RIR that this proposal was discussed as recently as June when high level defence talks held in New Delhi that were led by Indian Defence Secretary R K Mathur and Rostec Chief Executive Sergey Chemezov. The new government in New Delhi is eager to see such an idea come into fruition, the sources said.